Families make the decision to homeschool for a number of reasons. Some make this choice as a result of an immediate need or life situation; others look at it as a lifestyle, and anticipate homeschooling "through the long haul". And yet, at some point, EVERYone stops homeschooling - at the very least, when the last one graduates. 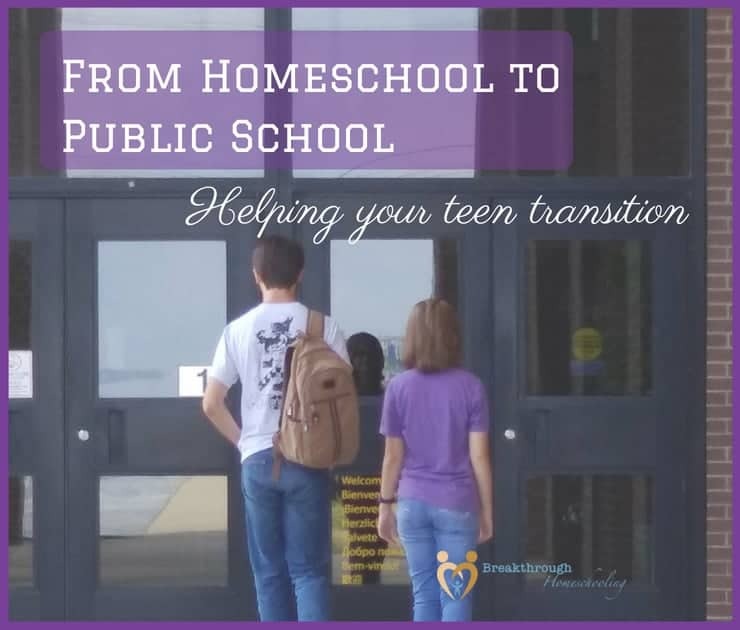 There are times, however, when a family may unexpectedly have to stop homeschooling...faced with a decision that results in a visit to the Principle's or counselor's office to register their child in a traditional school. This is what I'm talking about today, and offering "part one" about how to deal with it. That's where we found ourselves recently: pulling our records together to enroll our kiddo #5 in the local high school as a rising freshman. Over the past few weeks, I've found myself having to prepare my "baby" to boldly go where none of our older kiddos have gone before... and grace the doors that my husband and I hadn't for over 40 years! So how do you prepare a homeschooled teen for public school? But up until now, our daughter's education has been largely delight-led. Yes, we've had curricula to follow, and she's had assignments and due dates, appointments, and meetings to keep track of. With pretty much nothing more than a 5 subject general requirement from the State, we've been able to tailor all of our teens' studies and materials in ways that were relevant not only to their learning styles but to their interests, as well. At this point, I'm focusing on 2 concepts: habits and character. It seems to me that with these two in place, our kiddo will be prepared to handle whatever she'll need to manage. Getting up at a certain time every. single. day. reinforcing the interpersonal skills she's learned and used over the years as she's interacted with people both younger and older than herself. Dealing with and responding to situations that she may not have dealt with up to now, is all-important. That issue alone is one that all parents - homeschooling or not - have to wrestle and trust God with as their teens grow. But most importantly, what I'll need to do is keep those doors of communication open between us. Let her know that there is no topic, no event, no activity that she can't bring to me to discuss, to evaluate, to process as she continues to grow up. The particulars of transferring from homeschool to public school vary from State to State and even from school district to school district. This transition is so much more than taking a public school placement test, or even preparing documentation and high school transcripts. Preparing her to succeed in this new environment may not mean she'll know exactly what to expect, but that she'll know who she can turn to when she needs assistance, have an understanding of how to process new experiences, and be confident in her own abilities to meet new challenges. In short: how to begin to navigate life on her own. Which brings me to Part Two of this process: mommy guilt. Follow along as I talk about dealing with the inevitable guilt that follows when you send your teen out from under your wings...no matter the reason, no matter the season. Do you have a teen in a traditional high school setting? Have you had a similar experience that you'd be willing to share? It's so helpful to learn from each other - we'd love to hear your thoughts in the comments! ← Moms: Take Time to Color and Be All the Better For It!